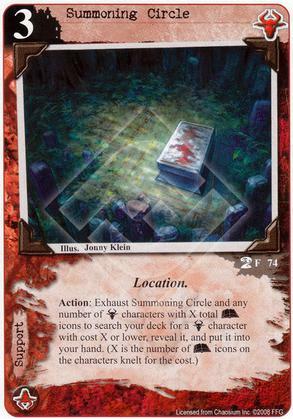 Action: Exhaust Summoning Circle and any number of [Shub-Niggurath] characters with X total (A) icons to search your deck for a [Shub-Niggurath] character with cost X or lower, reveal it, and put it into your hand. (X is the number of (A)icons on the characters exhausted for the cost). Not worth the costs for just getting a character into your hand.